It's Eid! !I made this card for my instructor on the occasion of Eid.I used new stuffs here: brads and flowers(they are really cute! 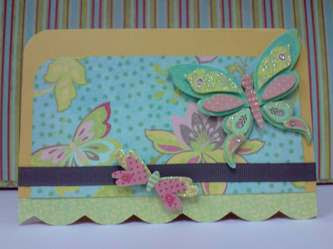 )The thickers were coloured by ColorQueue Box Stamp pad.The last touch was the faux stitching.Hope you like it. My sister wanted a card for her friend who was getting married and I had to do it in a very short time. I was too sick that day but fortunately I managed to do it. You just feel great when you end up with a beautiful card. I liked the butterflies here. 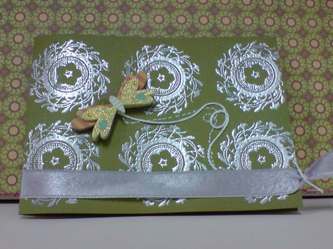 They perfectly matched with the patterned paper.The punching troubled me a lot but it turned beautiful at the end. This is my first post. 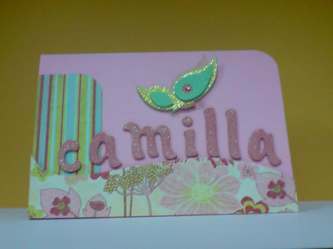 I'm happy to say that I'm really fond of crafts and especially cards. I thought I can share my cards with you and you too can do the same. We can exchange ideas here and help each other improve. This blog is for both: you and me. Always feel free to visit and participate.